On the 15th May I went past my Mom’s home to give her the post I had just collected from the post office as well as to say good-bye as I was going down to Cape Town for a few days. We chatted for a few minutes next to my car and I asked my mom a favour. Last winter she had knitted me a pair of beige mittens that I found very useful early in the morning during our odd cold spells.Most of my wardrobe in winter is black, so I asked her to please knit me another pair in black for this year. The next day I received a call from my brother Frank to let me know that my Mom had died. She had a heart attack and was found early Friday morning in her flat. This came as such a shock to all of us as she was healthy and had lived a healthy independent life for 82 years. At the funeral a week later, one of my mom’s friend let me know that she had a gift for me. The gift was two pairs of BLACK MITTENS.I asked her how she knew that I had asked for this last request from my mom. She said my mom had come inside after I left that Wednesday and asked one of the ladies for some black wool as I wanted mittens in black. My mom never finished the knitting so one of the ladies decided to complete them as a gift for me. I know that this was a way that she too could mourn the loss of my mom and at the same time bless me. I cannot tell you how much this small act of kindness has touched me. In this past week with our temperatures reaching levels we don’t enjoy, I am reminded each morning of both my mom and this act of kindness. I do not knit or do any craft work in this life stage as I am very busy and feel that I would never complete anything. However knitting a pair of mittens is a very small project and can be finished with a few hours of relaxing time in front of the television. I was sharing my story with my friend, Melodie this week and she said I must give her the mittens and she will write out the pattern for me. The next morning, I received the pattern and a purple set knitted by Melodie. Another act of kindness. I am now going to dedicate this project of knitting mittens to my Mom and the acts of kindness shown to me. We can all do small acts of kindness that hold no monetary value but touch the heart and soul at a deep level. 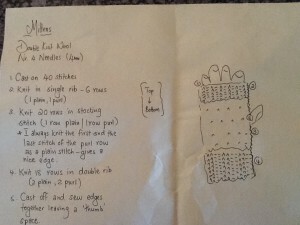 I am including the pattern here in case you too want to share or knit a pair. I have no doubt as you drive around you will know who to give them too. It may be a friend or just someone on a street corner. Do it with love. It makes the world go round. Thank you again for this act of kindness in my life as I learn to live without my MOM.